Using the new Tempo Fulfilment Module (TFM) to integrate Labcyte’s Access directly with Titian’s Mosaic software gives sample managers easy access to their acoustic liquid handling tools, and avoid issues with handling the new data stream these provide. Labcyte and Titian enjoy a collaborative partnership where methodologies are designed in tandem to produce a reliable, versatile and intuitive integration between our two platforms. 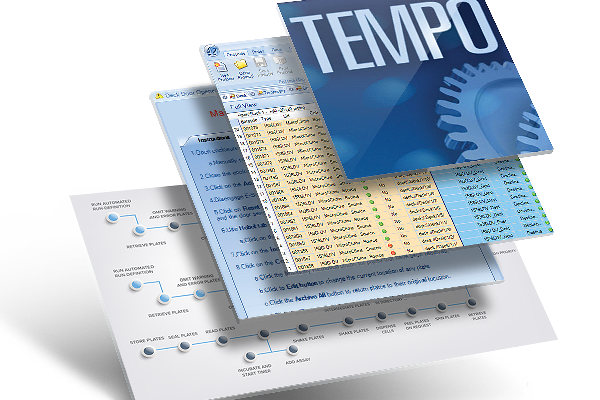 You can learn more about the Tempo Fulfilment Module (TFM) here. Get in touch with Titian’s sample management experts. Labcyte, a global biotechnology tools company headquartered in San Jose, California, is revolutionising liquid handling. Echo® liquid handling systems uses sound to precisely transfer liquids without contact, eliminating the use of pipettes. Labcyte instruments are used worldwide throughout the pharmaceutical and biotechnology industries, as well as by hospitals, service laboratories, contract research organisations, and academic institutions. Our customers work across a wide spectrum of scientific research, including drug discovery, genomics, proteomics, diagnostics and personalised medicine. Labcyte has 60 US patents and others internationally. Founded in 1999, Titian Software supplies software and consultancy to improve sample management and inventory logistics for life science research. Mosaic is Titian’s customisable, modular software to control and monitor all aspects of sample storage and preparation for compounds, reagents and biologics. Companies worldwide, from small biotech to global pharma, trust Mosaic to provide a seamless, error-free sample supply chain. SampleBank and FreezerManagement provide optimised and pre-configured subsets of Mosaic available for rapid deployment. For more information, please contact Titian.